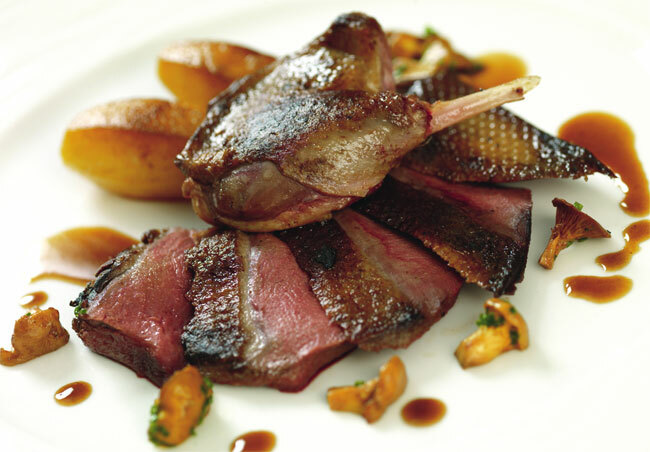 Game should always be cooked on the bone and served with seasonal accompaniments. Trim and prepare the duck for roasting. Trim some of the fat off the smoked duck and cut into medium dice. Cut up the mushrooms if necessary. Take a cast-iron pan, small enough for the bird to fi t in snugly, and heat up the oil until smoking. Place the seasoned duck in the pan and sear on all sides. Put in the oven at 200°C/Gas 6 for 10 minutes. Then add 1 spoonful of butter and continue to cook for a further 10 minutes, turning and basting twice. Remove the duck and leave in a warm place to rest. Discard most of the fat, leaving a little for cooking the shallots. In the same pan, cook the shallots over a moderate heat for a few seconds. Add the mushrooms and continue to cook until they are soft and render some of their water. Pour in the brandy and Madeira, bring to the boil and fold in the rest of the butter, the smoked duck and parsley. Serve the sauce hot with the roasted duck. This is a wonderful dish which incorporates the rich soy and truffle vinaigrette with the smooth, creamy flavour of the celeriac. This contrasts beautifully with the meaty scallops which are delicate in flavour against the intense flavour of the soy and truffle. This has become one of my signature dishes. Make the celeriac purée, the soy truffle vinaigrette and the French vinaigrette in advance. Purée: In a saucepan sweat the onion, celery and salt with the butter, add the milk and water then the celeriac and pepper. Bring to the boil and reduce to a simmer. Cook out for 30 minutes and then allow to cool. Pass off through a colander and then place into a robot coupe (food processor) and blend until fine. Remove from the robot coupe and then place into a blender and blend to a very fine purée. Soy vinaigrette: Sweat the shallots in the 30ml of olive oil and a pinch of salt and lightly colour. Add the mushrooms and thyme and sweat for a further 2 minutes. Add the soy sauce and reduce to nothing, now add the truffle juice and reduce by half. Add the veal glace and bring to the boil, place into a blender and blend to a fine purée. Warm 100g of olive oil and add to the pulp, then add the truffle oil. Correct the seasoning and then pass through a fine sieve. Place into a plastic bottle and use at room temperature. French vinaigrette: Mix all the ingredients together in a bottle and shake before using. To serve: Pan fry the scallops in a non-stick pan in olive oil. Dress some celeriac onto the plate, and then some soy vinaigrette. 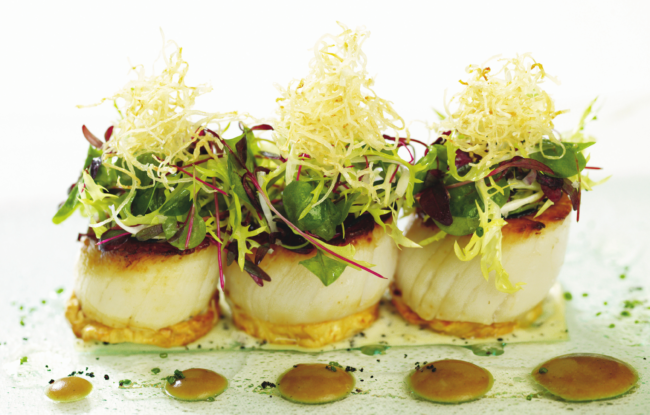 Now place 3 scallops onto the plate and top with the salad dressed in the French vinaigrette. A really refreshing autumn pudding, but one that can be enjoyed all-year-round. The shortbread can be made well in advance. Shortbread: Sieve the flour. Mix in the fat and sugar with the flour. Combine all the ingredients to a smooth paste. Roll carefully on to a floured surface half a centimetre thick. Place on a lightly greased baking sheet, bake in a moderate oven for approximately 15-20 minutes. Before it becomes too cool, cut out four rings. Spiced apple: Put the lemon juice and zest in a stainless steel pan along with the apple pieces and cook gently with a lid on until the apple is soft. Allow to cool. Fry the breadcrumbs in the butter, not too fast, remove from the heat, add the spices and sugar, allow to cool on a plate. Make sure it is all mixed well. Place a shortbread in the bottom of each ring. Put an eighth of the apple sauce on top of each and then an eighth of the crumb mix on each, repeat again so you finish with a level crumb topping. Allow to set and then turn out of the ring and serve with Calvados ice cream. Whisk the egg yolks and sugar until pale. Boil the milk, add to the egg mixture, return to the pan and cook until it coats the back of a spoon. Remove from the heat and pour into a bowl, add the cream and Calvados straight away to stop it cooking on. If you overcook the eggs and milk and it curdles, liquidise the mix and it will come back. Allow to cool, refrigerate for an hour at least before putting in the ice cream maker to churn. 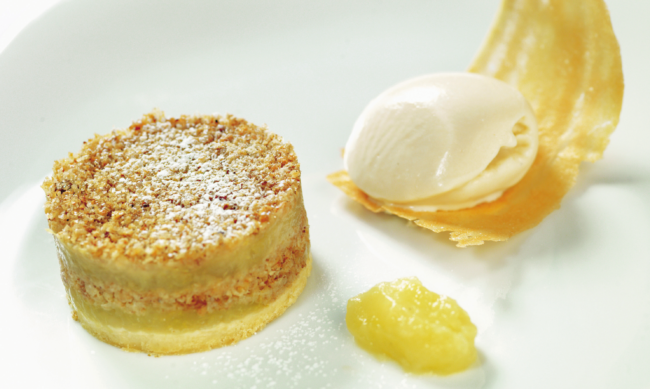 When the cakes have set, turn out of the rings, onto individual plates, and serve with a scoop of the ice cream. Make the day before, it sets better. You can buy some vanilla ice cream to serve with this but if you have an ice cream machine, Calvados ice cream is easy to make. Recommended wine Liqueur au Calvados – Lecompte.